We perform Samsung appliance repair as well as maintenance and installation. Our company specialises in Samsung and knows everything there is to know about this great brand. We repair all Samsung kitchen and laundry appliances such as refrigerators, ranges, microwaves, dishwashers, washers, and dryers. Our technical team is factory trained and certified. Give us a call and we will quickly diagnose your problem, order parts and do a professional repair in no time. In fact, we carry all the Samsung genuine parts. Our service is fast, reliable and easy on your budget. 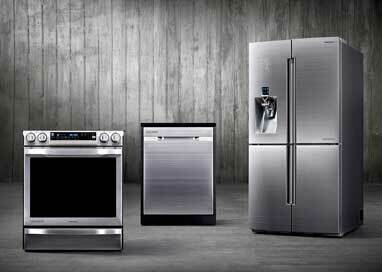 After an appointment with our knowledgeable technician, your Samsung appliance will be working as good as new. We guarantee it. 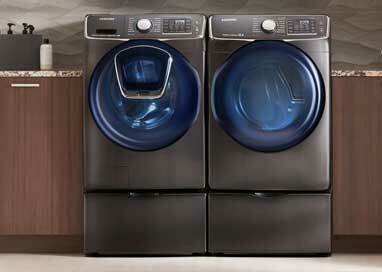 Samsung makes high quality and very innovative appliances. They are always pushing the envelope when it comes to new technology. For example, they offer Family Hub™ on their refrigerators. It is Wi-Fi enabled touchscreen that lets you manage your groceries, connect with your family and entertain like never before. With all this technology involved you need a specialist to take care of repair and maintenance of your Samsung appliances. We are such specialists. We are on top of the latest technology that has to do with appliances. Our company knows how to fix it and how to keep it running for a long time. We have all the tools necessary for any Samsung repair. Besides being very knowledgeable about Samsung appliances we also offer our client some of the best customer service around. Our technicians are all polite and respectful. They always come right on time and are fully prepared for every job. We offer flexible scheduling, as well as accurate estimate and FREE service call with every repair job. Our prices are very reasonable and honest. We also offer you a 3 yearwarranty on parts. We try to make your service appointment fast and convenient for you. And you will be more than happy with the final results because your Samsung appliance will be perfectly functional with our help. Top Home Appliance Repair has been in business for more than 30 years. We do our best to keep our customers happy. We are family owned, and family managed a company. Our area of service is Los Angeles, Ventura County, Marin County and East Bay. Besides Samsung appliance repair we also do refrigerators, dishwashers, washers, dryers, stoves and ranges, ovens, steam ovens, microwaves, freezers, ice makers, BBQs, pizza ovens, patio heaters and much more. We do both residential appliance repair and commercial appliance repair. Call us if you need any appliance repair done both indoor and outdoor. For Samsung appliance repair call us or fill out our short contact form. We will provide your with our FREE over the phone estimate and will schedule a convenient service appointment for you. Our technician will be on his way to your house ready to tackle any problem you have. He will bring with his van loaded with all the tools, equipment, and parts necessary for your particular project. Once our technician is in your house, he will get to work right away troubleshooting, repairing and replacing parts. Before long your appliance will be fixed. We work fast, and we know what we are doing because of our extensive training and experience. After the job is compleat, out technician will clean up after himself. He will dispose of all the broken parts. As a final step, he will plug in your appliance and test it to make sure it’s working perfectly and is safe. He will also offer you some advice on how to best keep your Samsung working smoothly. We also offer annual or bi-annual maintenance program to our customers. It covers all appliances in your kitchen and laundry. As a part of this program, our technicians will do all the maintenance for you on a regular basis. They will inspect your appliances every time and catch any problems before they become significant. This maintenance service will save you time and money. Why choose us to do Samsung appliance repair for you? You can trust us to do Samsung appliance repair for you because we got the skills and experience needed. Our technicians are factory trained and certified to repair Samsung. We are up to date on all the latest Samsung technology. Whether it is Family Hub™, Virtual Flame ™, AddWash™ or any other exclusive Samsung innovations we know how to deal with them. Our services are fast, professional and affordable. We try to keep our customers happy by giving them great results and making the whole appliance repair as convenient as possible. For Samsung appliance repair, please call us at 925-265-7782 in East Bay or 628-214-0064 in Marin County. or fill out our short contact form. We would love to talk to you and answer all of your questions. Besides Samsung appliance repair are also certified to repair Asko, Bertazonni, Bosch, Dacor, DCS, Electrolux, Fisher&Paykel, Frigidaire, GE, Jenn-Air, KitchenAid, La Cornue, LG, Liebherr, Marvel, Miele, Perlick, Siemens, Sub-Zero, Thermador, Traulsen, True, Viking, Whirlpool, Wolf. We perform Samsung appliance repair as well as maintenance and installation. Our company specialises in Samsung and knows everything there is to know about this great brand.